Small batch vodka handcrafted with grit and fury. You don’t belong with them. Somewhere between birth and school, the mainstream got a hold of you. You listened because you had to. You followed convention because you didn’t know any better. But it was always hard to swallow. Then the day came when you met you. The well-rounded peg amongst square holes. The one who forged their own path—despite the constant bruises and scars. The one who rewrote the rules only to break them again. And the one who made it their status quo to never be the status quo. You stopped caring if you fit in or not. In fact, you chose not to. In the process, you found your small tribe of fiercely independent doers and makers. Or, perhaps they found you. Instead of working tirelessly to build someone else’s dream, you made it a life to build your own. Truth is, you never fit their mold. You were always a misfit. Established 2017. But the hard work started well before. We respect your privacy. 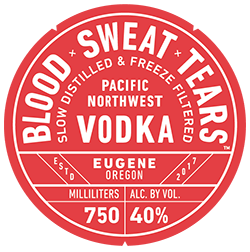 By submitting your email address you authorize Blood x Sweat x Tears Vodka™ to send you periodic emails containing news, special information, offers and more. We’ll never sell you data anywhere. Thank you! You will be receiving an opt-in notification in your inbox. Be sure to accept that opt-in to be subscribed.